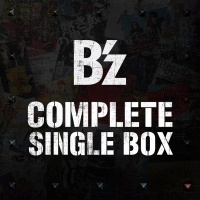 B'z COMPLETE SINGLE BOX is a premium physical collection of the band's first fifty-three singles and all associated B-sides, with a total of 117 songs included over 53 individual discs. The singles included range from 1988's debut single "Dakara Sono Te wo Hanashite" through the June 2017 release "Seimei/Still Alive", with the latter and its two preceding singles—"RED" and "Uchouten"—being collected for the first time. Additionally, the set comes with a pair of DVDs compiling many of the band's most memorable moments and some unreleased material, with one performance included for every single through the aforementioned "RED". Several B-sides are available here in a physical collection for the first time, including many of the band's oldest ranging from "Heart mo Nureru Number ~stay tonight~" to "Mannequin Village", "Tabi☆EVERYDAY", "Magnolia", and "Lonely Stars". This collection includes the normal edition of the "Ai no Bakudan" single, omitting the two alternative versions of the lead single only available on the limited edition. In addition, "Don't Wanna Lie -Ballad Version-" has also been omitted from this collection, since it was only available as an exclusive mail-order CD at the time of its release. Special bonus DVD content available on limited editions of certain singles, such as B'z Special LIVE at EX THEATER ROPPONGI included with their fifty-first single "Uchouten", are also unavailable in this collection. The box set comes in two editions: a mass-market "Black Edition" for 50,000 yen and a 7-Eleven Japan exclusive "Trailer Edition" for 70,000 yen that requires reservation five months ahead of delivery as each one is being made-to-order. The two packages weigh 6kg and 8kg respectively, making them by far the largest packages B'z has ever brought to retail as well as the most expensive. The cover art in the "Black Edition" has each been refreshed with golden-colored discs inside of LP vinyl-sized folders. Much like their respective packaging, the discs themselves are printed differently with each edition as well with the "Trailer Edition" discs being black and having individual hard cases for each single. The "Black Edition" comes packed with a 100-page lyric book of similar dimensions to the overall package, while the "Trailer Edition" comes with a different, tailored 117-page book of the same sort. A pair of special live promotions hailed as 7-Eleven presents B'z PREMIUM LIVE were also announced to take place immediately prior to B'z LIVE-GYM 2017-2018 "LIVE DINOSAUR": one at Zepp Tokyo on December 5 and another at Zepp Osaka Bayside on December 7. Entrance to the shows was announced to be determined by lottery following reservations of the "Trailer Edition" of B'z COMPLETE SINGLE BOX at 7-Eleven locations beginning in September. Each show was limited to 2,500 people with each winner receiving a pair of tickets. This was to be the fourth such showing of its kind, following 2011's Pepsi NEX presents B'z 1DAY LIVE, 2012's Pepsi NEX presents B'z PREMIUM LIVE which also ran for two dates, and 2013's B'z Special LIVE at EX THEATER ROPPONGI. Notably, a similar release was made available exclusively on the Japanese iTunes service in 2005 entitled The Complete B'z, which served as the band's digital debut and contained six exclusive tracks—all since rendered unavailable—including their Japanese cover of "This Love" originally by American band Maroon 5. Upon release, B'z COMPLETE SINGLE BOX in its "Black Edition" sold roughly 5,000 copies and ranked at number eight on the Weekly Oricon Album chart. Due to the nature of its release, no release message was prepared by B'z ahead of time for the official website. Sales of the "Trailer Edition" are not available due to being exclusively available for order from 7-Eleven stores in Japan. All music and guitar by Tak Matsumoto. All lyrics and vocals by Koshi Inaba. Both the "Black Edition" and "Trailer Edition" come packaged with a "B'z LIVE-GYM COLLECTION" DVD set. The two DVDs serve as compilations of previously-released B'z material dating from B'z LIVE-GYM "Pleasure'91" to B'z LIVE-GYM 2015 -EPIC NIGHT-, with three all-new performances included amongst them. All three songs make their home video debut in the set: "Kimi no Naka de Odoritai" from "Pleasure'91", "LADY-GO-ROUND" from "BREAK THROUGH", and "May" from Pleasure 2000 "juice". This marks the first occasion in which any performance from B'z LIVE-GYM "BREAK THROUGH" has been excerpted in full. B'z LIVE-GYM '91~'92 "IN THE LIFE"
B'z LIVE-GYM Pleasure'93 "JAP THE RIPPER"
B'z LIVE-GYM '94 "THE 9TH BLUES -Part2-"
B'z LIVE-GYM 2002 "GREEN ~GO★FIGHT★WIN~"